John Debney's involvement in "The Passion of the Christ" was not planned. While Mel Gibson was still searching for the best composer for the job, Debney had learned of the vacancy and composed some cues on spec. When these were played for Gibson, he liked what he heard and Debney was soon appointed. John Debney was not an obvious choice for this film since he was best known for family and comedy movies like "Elf" and "Bruce Almighty", although the latter may demonstrate a qualification of sorts. Nevertheless the movie suited his religious beliefs and his bid for the composer's job was readily accepted. Like many previous movies with a religious subject matter, this film was greeted with a combination of eager anticipation and dread from the representatives of various communities. When news of the cinematic approach became known inevitable controversy ensued about the on-screen violence and the depiction of Jews. We have not yet seen the movie but it is the soundtrack we are here to review, and it is an interesting and satisfying listen. So what principles have guided the creation of The Passion's music? Firstly, the film's dialogue is recorded in Aramaic and Latin, and so the texts used by the soundtrack's vocals are also in these ancient languages. Secondly, there are musical references to the region and period. Although no-one knows precisely what kind of music might have accompanied the life of Christ, Debney makes some plausible suggestions. Thirdly there is an expected element of religious mysticism though this is not overplayed. And fourthly, there is a distinctly modern vibe to the soundtrack arising particularly from the drums and percussion, and the general sound design elements. Although all these elements are present, the result is far from being a jumble of ideas. It has been skillfully crafted together to make something simultaneously ancient and modern and therefore timeless. The overall blend works well, and at times it is difficult to know where an acoustic instrument stops and electronics take over, or at which point this turns into a vocal. It is all so seemlessly integrated, and the result might be compared with the work of Hans Zimmer on "Gladiator" or "Black Hawk Down" or to Lisa Gerrard, who has collaborated with Zimmer on a couple of movies including Gladiator. We don't want to give a track by track analysis, but to give you a flavour of what to expect. The first track "The Olive Garden" is a quiet and atmospheric introduction with wordless ethnic vocals and instruments blending into sound design. "Bearing the Cross" starts off in a similar vein, but then a percussion rhythm brings in a choir singing some verses, very effectively mixing old and new. The whole track heightens tensions and emotions with small flourishes of ethnic instruments and orchestral brass chords. "Jesus Arrested" and "Peter Denies Jesus" bring in very dark and mysterious material some of which would not sound out of place in a horror movie. "Song of Complaint" is a simple elegy, a lament with an improvised feel played on the Armenian Duduk (we think) complete with drone. "Simon is Dismissed" has heavy drums beats plus atmospheric sections with floating pan-flute type sounds. "Flagellation" plays against the expectations of its title with a moving lament beginning with the orchestra and then into more dreamlike material. "Mary Goes to Jesus" is the heart of the soundtrack: a female vocal solo, a love theme with orchestral and choral support. "Peaceful but Primitive" is an impression of period street sounds, and in "Crucifixion" the drums might suggest the hammering of nails, while an old fashioned hymn-like melody rises in a powerful orchestral adagio. From this brief summary you can see how the composer has responded to the film. John Debney has made a conscious effort to be different and surprising, but still true to the subject matter. He has created a new musical facet to this familiar story, and the soundtrack will find a welcome home in any soundtrack collection. 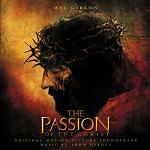 The Passion of the Christ soundtrack is available from www.amazon.com and www.amazon.co.uk. A Sheet Music collection of 9 pieces for piano is available from these links at the following stores: The Music Room and Sheet Music Plus.